Islamist terrorist cell broken up by FSB security services, planned to attack capital's public transit system. Russia's security services said on Monday it foiled a terrorist attack on Moscow's public transport system by a group of Islamist terrorists, some of whom were trained by ISIS jihadists in Syria. A statement by the federal security service (FSB) said they had detained a group of people in Moscow and seized bomb-making materials they were planning to use in an attack on the capital's busy transport system. "During questioning of two of the detained men, it became known that they were planning a terrorist attack on the Moscow public transit system," said the statement which was carried by Russian news agencies. Russian security forces had on Sunday arrested at least three people in a raid on an apartment block in central Moscow where security forces also found an explosive device, with dozens of people evacuated from the area. The raid came after the security services identified a Moscow address "where six to 11 people periodically lived, some of who went through combat training in Islamic State camps in Syria," it said. The FSB said the suspects arrived back in Russia long before Moscow launched a bombing campaign in Syria late last month. It was not immediately clear how many people had been arrested in total. Footage of Sunday's raid shown on Rossiya state TV channel showed police officers carrying sacks of "evidence" out of the building, including a washing machine that "could have been used as a hiding place." Officers found a device consisting of a plastic bucket with ammonia and aluminium powder, complete with a phone-activated detonator, the report said. Moscow started air strikes in war-torn Syria in late September following a request from its long-standing ally President Bashar al-Assad. Moscow claims it is targeting ISIS and other "terrorist" groups, but in practice the Russian air force is mostly bombing more moderate rebels battling Assad's forces and ISIS alike. Russia - which has battled its own Islamist insurgency in the volatile North Caucasus - says that some 2,000 of its citizens are fighting in the ranks of ISIS. 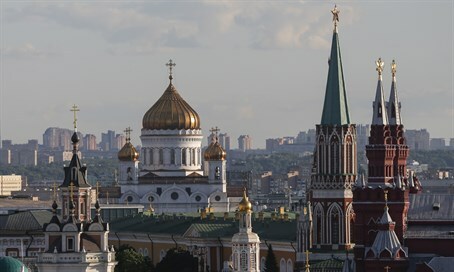 Moscow suffered the last in a string of bloody attacks in January 2011 when Islamist insurgents killed some 37 people in a bomb blast Domodedovo airport.